Want to stay in Bangkok and feel like a bit of a dip then you might have to pay top dollar for a hotel with a swimming pool. However there have been a few new hotels open up in Bangkok some right on Sukhumvit road that are cheap and affordable that also have a guest swimming pool. Don't expect some grand over-sized pool however but then these hotels don't have hundreds of guests either. So if your looking for something cheap and with a swimming pool to drown yourself after a long hot day walking the streets of Bangkok check out these great cheap hotels in Bangkok with swimming pools. Don't expect much from a hotel located in the Business district of Bangkok that also has a swimming pool. For $16 a night in this area your getting a pretty good deal to begin with let alone being able to jump into the pool. A short motorbike ride and your in the heart of Patpong. I've never met a backpacker who came to Thailand who didn't stay on Khaosan road. And for backpackers who don't mind shelling out twenty bucks for a room with the best swimming pool a cheap hotel in Bangkok has to offer. 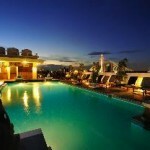 It's large because the hotel offers over 200 rooms each one appointed splendidly as well. Another good Khaosan road hotel with swimming pool this affordable hotel has a small swimming pool which I'm told you'll see plenty of tourists staying here. The reviews are good but I'm told the pool get's a little cool in winter because it's shaded but in the middle of the hot season that is a blessing. The Florida hotel in Bangkok is a popular hotel for shopping in Bangkok because it's located right near the shopping and fashion district of Bangkok. 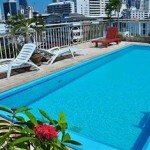 It also has a small rooftop swimming pool and is just a short stroll from the Phayathai BTS sky train station. The hotel has had some renovations but is still pretty old, it's good value for money. Looking for a home away from home, the comfort of a Guesthouse but the duds of a hotel then the Vacio Guesthouse in Bangkok might just be your style. 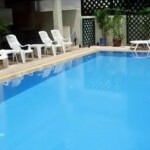 One of the best swimming pools on this list of cheap hotels in Bangkok with swimming pools. If you want a guest friendly hotel in Bangkok that is close to the action yet affordable and has a decent swimming pool then check out the Teja Lake view apartments. You can get a 2 bedroom apartment with kitchenette for 1000 baht a night. This is a great place to come with a mate don't share a room share your own apartment. Not exactly on the cheap side but not too expensive either for a hotel in Bangkok that has a swimming pool. 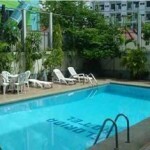 It's also a great place to take the family as it has 2 and 3 bedroom apartments as well. Aside from the pool the hotel let's guests enjoy the sauna and fitness room as well. I normally go a bit cheaper than these places because I don't really care if my hotel has a swimming pool or not but if I were looking for a hotel with a swimming pool in Bangkok these are the hotels I'd be looking for. The one in particular which caught my eye was the Teja Lake View Apartments because it has 2 bedroom apartments and since I always seem to go to Bangkok with a friend the idea of sharing a 2 bedroom apartment with kitchen for 600 baht each close to Nana sounds very appealing. It's hard to find 2 bedroom apartments let alone as a hotel at that price in Bangkok so looks like a total steal. Not sure how long the promotion is for but i'm sure it won't last. If you have been to any of the aforementioned cheap hotels in Bangkok with swimming pools then please let us know what they were like in the comments area below. Would it b possible 2 get similar cheap hotel info’s in Koh-Phnayan or Pattaya too ? i visit, any suggestions around pratunam ? The Swan hotel, Bangrak . It is like staying with family. Great food and service. No cleaner swimming pool on Earth. Though none of the guests on their way to elsewhere seem to have any regard for pool rule #7. It is well worth the cab fare and motor way tolls to get elsewhere in BKK. We stay there often and have never been let down. Be polite and humble, you’ll get complimentary WiFi [ask]. Tell manager, Charles & Nithisa from Isan sent you. He has perfect English and manners. avoid Sam’s Lodge . Better to sleep at airport. 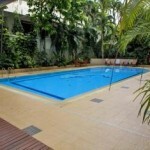 I am searching for a good value Guest House in Kao San rd. do u have any suggestion for less than 300 Baht/night? I stayed somewhere on Kao San road for 500 baht a night, spent 3 nights there. I’ll NEVER do it again nor will I recommend. There are plenty of 300 baht places, I wouldn’t recommend them to anyone.